One of the least pleasant aspects of being a travel writer, ironically, can be the actual travel part. Once you arrive in a destination, the enjoyment begins, but getting from A to B (particularly on an international flight) can be a pain. 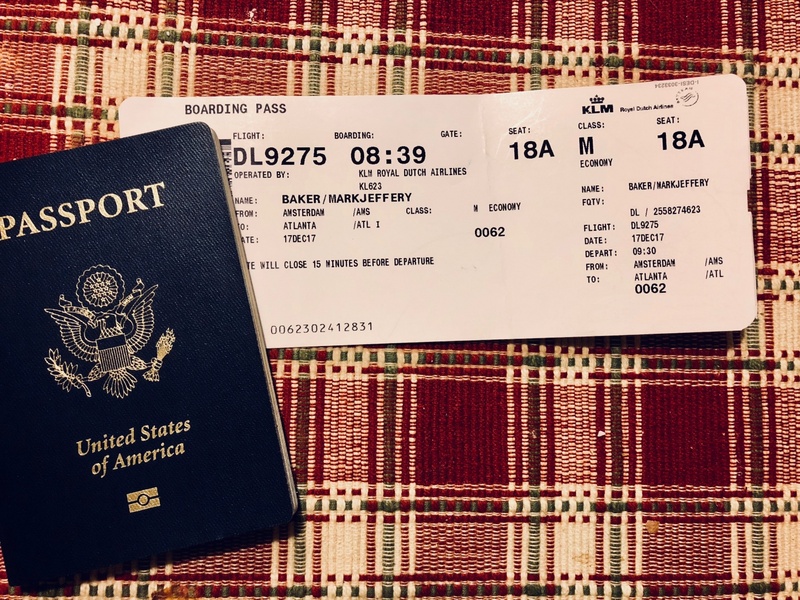 Each year over the Christmas holidays, I fly home to the U.S. from Prague to be with family, and I know from experience to gear up for the long lines, delays, and frustrations. 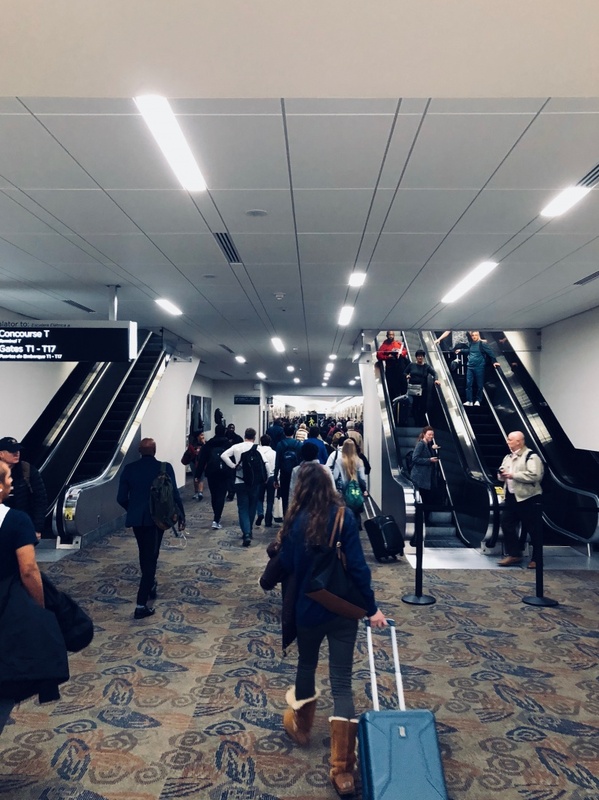 I’m not sure, though, what I could have done to prepare for what was waiting for me (and thousands of others) at Atlanta’s Hartsfield-Jackson Airport on Sunday, December 17, 2017, when the lights (literally) did go out. Top Photo: The headline of the December 18 edition of the 'Atlanta Journal-Constitution.' The airport blackout was huge local news, but it also affected flights around the United States and the rest of the world. Let's hope all the players here learned the right lessons. I know I did. Photo by Mark Baker. Posted in Diversions, On The Road and tagged airport, Atlanta, Christmas, problem, Travel, USA. 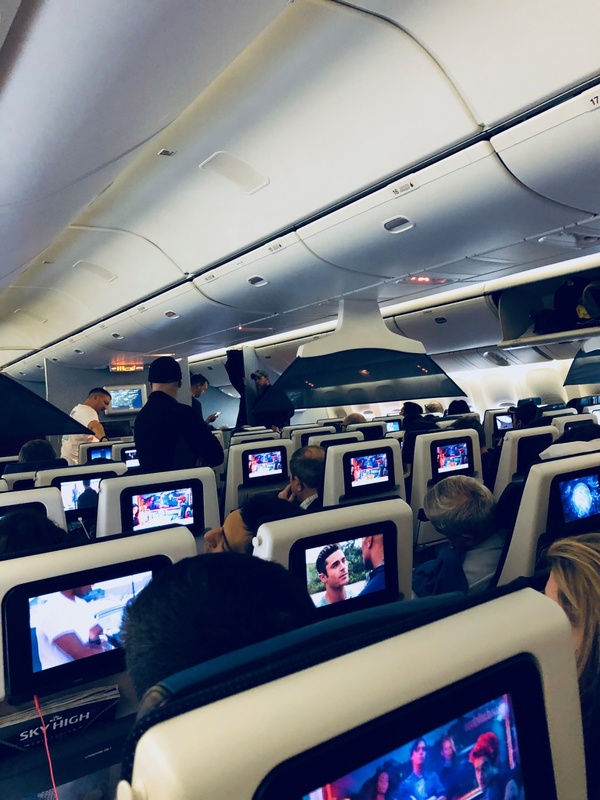 I didn't realize it at the time I boarded my plane in Amsterdam, but Delta flight DL9275 was going to was going to be one of the longest flights of my life. The transatlantic flight part took nine hours; the sitting on the tarmac part took another six hours. Photo by Mark Baker. Delta's customer-service Twitter account, @DeltaAssist, suddenly became my best friend as we were trapped on the runway at the Atlanta Airport. Photo by Mark Baker. As our plane touched down in Atlanta on the second leg of a three-flight trip from Prague to Pittsburgh and began its slow taxi to the gate, I was feeling pretty good. The ride over the Atlantic from Amsterdam had been smooth. Fate was on my side for the first, early-morning flight out of Prague. I’d managed to escape before snow started to fall there and snarl flights getting out of Václav Havel Airport. Traffic through Amsterdam’s Schiphol, usually a bottleneck, had been light. I cleared the EU’s passport control in 15 minutes. My only complaint, so far, had been that the transatlantic leg wasn’t operated by Delta Airlines (from whom I bought the ticket), but rather by its partner airline, KLM. This meant I didn’t have the option of choosing a special in-flight meal. My favorite these days is “Hindu Vegetarian,” but I dabble in “Kosher” and “Gluten-Free” from time to time. It was "chicken or pasta?" for me, like everyone else, so I skipped the meal altogether. It was no big deal. As the plane rumbled across the Atlanta tarmac toward the gate, I stared out the window and thought about the next stage of the journey. I’d still have to go through customs (including monkeying around with the U.S. border control’s silly machines for issuing landing cards), claim my bags, re-check them onto my connecting flight and stand in yet another security line (sigh). We were on time, though, and I had almost two hours to do all of this. I assessed my chances as very good. Just at that moment, though, and without warning, the plane stopped in its tracks. We were still out in the middle of nowhere, and as far as I could tell well away from the terminal. As one minute stretched into two, and then into ten, and then into twenty, a collective sense of unease seeped into the cabin. Passengers with tight connections nervously glanced at their watches. As any frequent flyer knows, those tarmac minutes can be crucial for whether one makes or misses the next flight out. In the end, though, none of this would matter. Our plane wouldn’t budge from the tarmac for the next six hours. We didn’t know it then, but the entire Atlanta Airport had lost electrical power just minutes before we landed. The world’s biggest passenger airport by number of travelers -- an airport that handles nearly 300,000 passengers every day -- had gone totally dark. We (and tens of thousands of others) were stuck in Atlanta for the duration, and the fun was only just getting started. This is the view from inside our plane as we were sitting on the tarmac. We were not permitted to taxi to the gate, but for the first part of the wait we also had no idea what was happening. The mood on the plane was calm and upbeat. Photo by Mark Baker. This Atlanta Airport media release crossed the wire after we'd been sitting on the tarmac about three hours. At least, then, we knew for sure it was an electrical fire, but we had no idea about the cause of the fire or when we would leave the plane. As I write this on Thursday, December 21, four days after my flight, there’s still not much information on what actually caused the power outage. The apparent cause was an electrical fire in an underground tunnel that quickly knocked out the main power supply and spread to a back-up generator. But what started that fire is still unknown. The authorities ruled out a terror attack, but as we were experiencing the outage in real time, the possibility of terrorism seemed to be high on people's minds (though I don’t recall anyone expressing the idea aloud – that was too scary to contemplate). 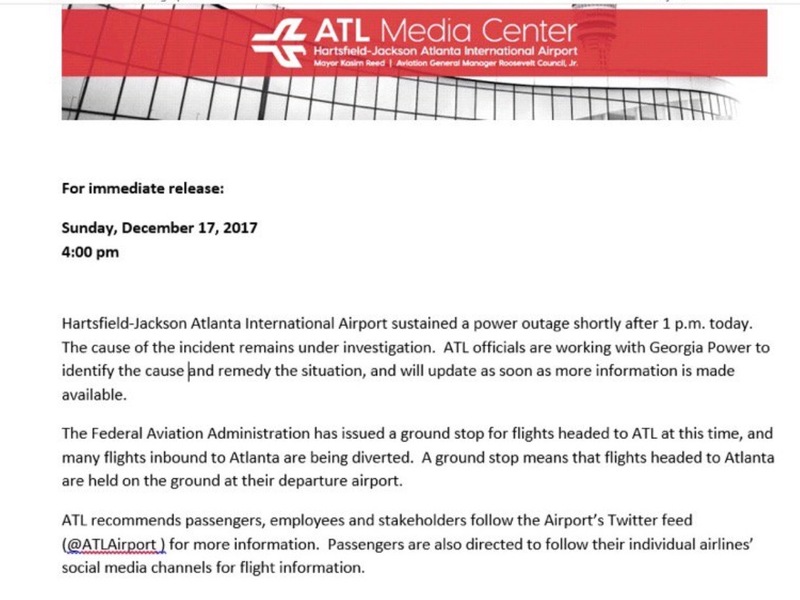 The Georgia Power Co., managers of the airport, and the mayor of Atlanta have apologized for the outage, and vowed to learn the right lessons going forward. As someone who experienced the event first-hand, though, I have a few questions to ask: How is it there was no back-up generating system that would have switched on automatically during the outage? Why were there not more emergency lights sprinkled around the airport to at least allow people to move around safely through the darkened terminal? Why do the airport’s trains and elevators apparently operate on the same power system as the airport itself (passengers were stuck inside claustrophobic train cars and lifts)? 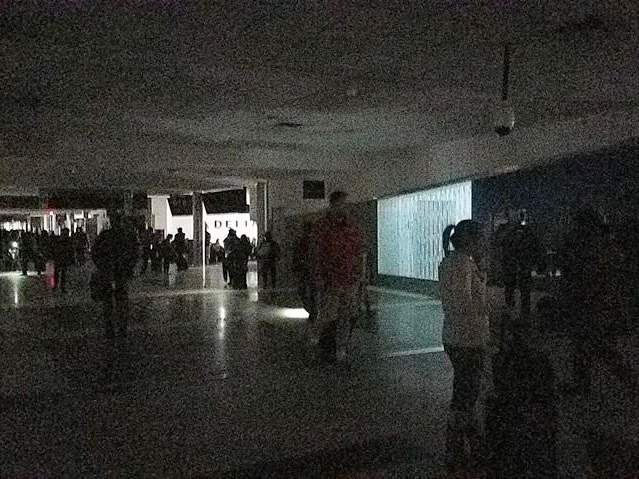 And, finally, why weren’t security personnel, members of the airport staff, and concession workers given at least some training to deal with something as foreseeable as a power outage? It’s fair to say that no one knew what to do. Many of the same lessons apply to Delta Airlines, though (at least as of this writing) the airline has not yet apologized to the thousands of its passengers who were adversely affected. Delta CEO Ed Bastian, instead, appears to be positioning Delta as another victim of the outage, saying the airline may have lost as much as $50 million and would seek reimbursement from the airport and power company. I understand the logic here, but I don’t think it's necessarily a good look for Delta. The majority of the flights in and out of the Atlanta Airport are run by Delta or its subsidiaries, and it's not obvious to most people where Delta ends and the airport begins. And Delta wasn’t exactly blameless in all of this, either. It too had put all of its eggs in one electricity basket, and when the power went down, the airline’s employees were left clueless to explain the situation to passengers or offer any informed advice for how passengers should proceed. To put it more succinctly: As the lights went out, as the lifts stopped running, as the planes froze on the tarmac, as the concessions went silent, and as the passengers stumbled their way through darkened terminals, Delta’s ground staff (often) simply vanished. The airline couldn't even get it right the next day, Monday (December 18), after the power had been restored. A glitch in Delta's computer system prevented stranded passengers from checking onto their re-booked flights electronically. This pushed tens of thousands of flyers into the arms of a few over-stressed booking agents working the full-service kiosks (the only place where passengers could obtain boarding passes). I waited at one of those kiosks for nearly three hours and missed my first re-booked Pittsburgh connection. This eventually forced me onto a later flight that afternoon. It was chaos. At the time, I had no idea if I was even waiting in the right line, and there was no one around to ask. These are some of the takeaways for the organizations involved, and I sincerely hope that they learn the right lessons here. But I had some takeaways for myself as well – and by no means were all of these negative. 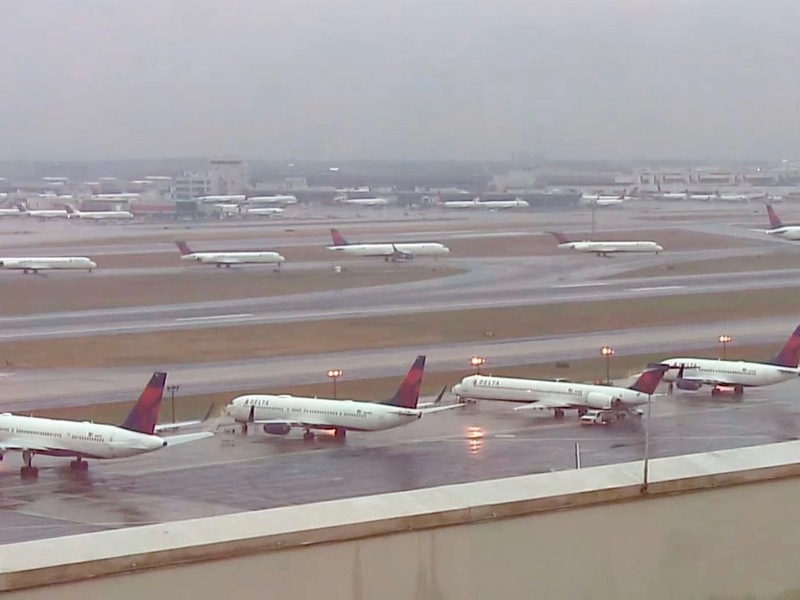 This image capture from Fox10 television shows planes backed up all over the tarmac. We landed at around 1pm and finally deplaned shortly before 7pm. Photo credit: Fox10 TV. 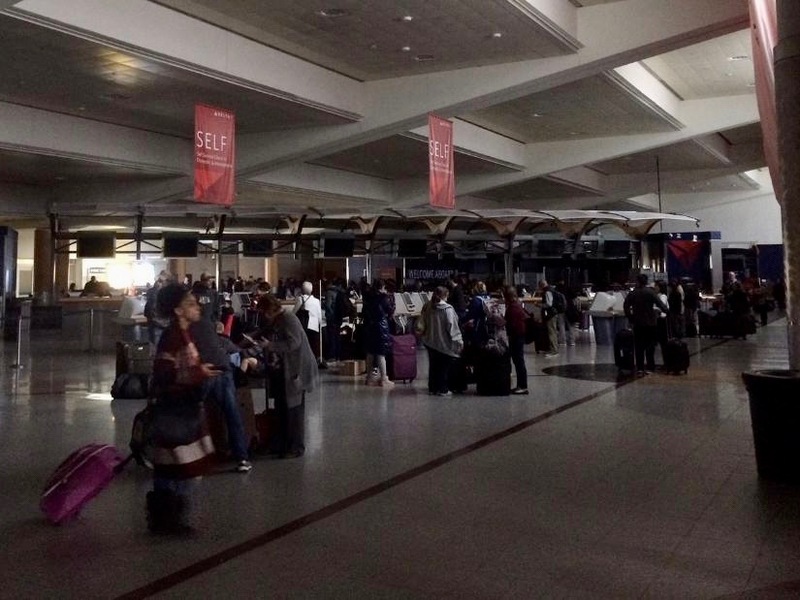 This image capture from 11Alive (credited to viewer Frank Mullin) shows the interior of the Atlanta Airport in darkness. Photo credit: 11Alive Atlanta. This CNN capture from Sunday, December 17, shows the airport interior in near darkness. The outage happened around midday, but lasted until mid-evening -- well after sunset. Photo credit: CNN. When I finally arrived at my parents’ home in Ohio, not far from the Pittsburgh airport, on Monday evening -- around 40 hours after I started my journey in Prague -- instead of feeling frustrated or angry, I felt oddly elated, fortunate, and even festive. Looking back on the whole episode, I realized I had truly lucked out. If the airline and the airport had let us down (and they did), at least on this trip we could count on the kindness of strangers and our fellow travelers. I'd seen it for myself in person. The magic seemed to start the moment our plane touched down in Atlanta and we were told we couldn't leave the aircraft. We ended up sitting on the Atlanta tarmac for almost six hours, yet for the entire time we were stranded there, not one passenger (at least no one I noticed) raised his or her voice, panicked, shouted, or even so much as complained. The mood was calm and even upbeat. Every once in a while a flight attendant would bring a round of cold drinks or hot tea. Once we got the green light to exit the aircraft, the plane taxied to the still-dark terminal so that we could proceed through U.S. customs control (we were an international flight, after all). Clearing U.S. customs is my least favorite part of any trip to the United States, as exhausted travelers flood into the customs areas only to be berated by humorless border-control officers: “U.S. citizens, green-card holders over here! Foreign visitors over there!” I find it confusing and intimidating. Though Delta ground staff had mostly disappeared, one part of the airline’s passenger-service infrastructure that proved highly useful was their @DeltaAssist Twitter account. I tweeted to this account several times throughout the day to ask for advice, including a tweet at 6.05pm asking whether they thought I had any chance of flying out that night or whether I should give up and try to book a room at a nearby hotel. The helpful reply came quickly: “Try to get a hotel room, Mark.” It was a surprisingly comforting presence. As a short aside, this stage of the outage highlighted for me how dependent we’ve all become on electrical power and how little we realize its presence in our lives. I’d somehow managed to make it all the way from Prague to Atlanta that day with 30% battery power remaining on my iPhone. This was crucially important since there was no place to charge a phone. Though the AT&T cell network over the airport would fade in and out, I used my phone to reserve a hotel room over Booking.com and to trade a few texts with my parents, who had been scheduled to pick me up in Pittsburgh later that evening. Mom: Are they feeding you? Are they going to get you your bags? Are they going to put you up in a hotel? Without power, the airline was simply powerless. I couldn't resist slipping in a picture of the 'Solis Two Porsche Drive' hotel -- a place I grabbed off of Booking.com in less than a minute, but that couldn't have been nicer or more accommodating. Hotel courtesy photo. Long lines at the counters at the Atlanta Airport on Monday morning. I couldn't check in electronically and I couldn't print my boarding pass. I had no clue what to do -- and neither did anyone else. Photo by Mark Baker. The scene from early Monday morning, December 18. The lights are on, some of the flights are running, but the airport train that takes passengers between terminals is still out. Photo by Mark Baker. Monday morning was pandemonium at the airport. 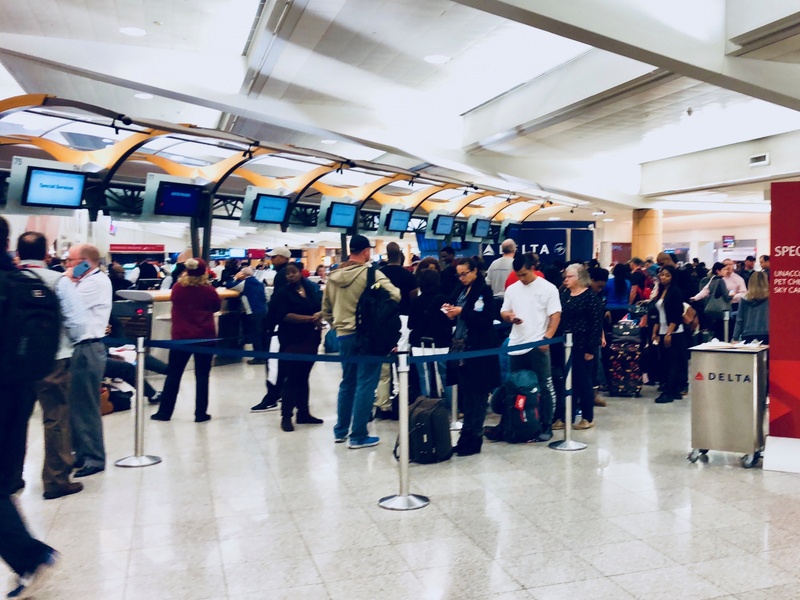 A Delta computer glitch wouldn't allow thousands of passenger to check in electronically, leading to huge lines at full-service kiosks. Photo by Mark Baker. My good fortune continued after I left the customs area and entered the arrivals hall of the terminal. Once outside, my first step was to find a cab. The room I had booked was at a place called the Hotel Solis. It was described as an “airport hotel,” though it didn't appear to be in the airport itself and I had no idea how to get there. The problem was that the line to hail a taxi stretched on for what looked liked at least a football field (100 meters). It would be a long wait. I hadn’t been standing more than five minutes, though, when I heard someone yell out over the crowd: “Is anyone going to the Hotel Solis and want to share a ride?” I couldn't believe my luck and quickly moved to the front of the line. A mother and her college-age daughter had kindly offered to share their cab. The Solis turned out to be one of the nicest, or at least best-value, airport hotels I’ve ever stayed in. Sparkling clean, relatively new, luxurious for the setting, and barely over $100 a night. The receptionist couldn’t have been nicer, apologizing for the airport fiasco while handing me a complimentary toothbrush and tube of toothpaste. The restaurant, she said, had great wine and Mediterranean food. 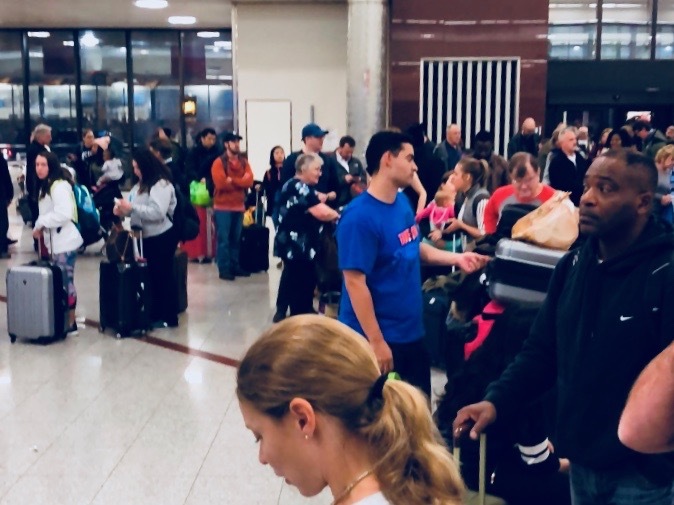 The bar and lobby buzzed throughout the evening, as stranded passengers stood around laughing and gabbing about what they were doing at the airport when the lights went out. I slept like a baby that night. I set my phone alarm for 5am the next morning. I knew the airport would be a zoo on Monday and I had no idea what the day would bring. I woke up, showered, and made my way downstairs. The lobby was nearly empty at that time of the morning, with only a couple of shuttle drivers sitting around ready to ferry guests back to the airport. “Can I give you a ride, Mr. Baker? I can take you over right now if you want,” one of the drivers asked. We hopped into the hotel’s brand-new shuttle van and drove over to the airport in the darkness. I gathered my thoughts for what would be another trying day. As we pulled up to the terminal, the driver turned, smiled, and wished me a Merry Christmas. It didn’t feel perfunctory at all and left me with a warm feeling that would last all the way to Pittsburgh on that particular day. We often criticize airline companies for all the ways they manage to make our travel more difficult, more expensive, and less comfortable, but it’s worth noting those occasions they actually do the right thing. Shortly after I returned home, I filed an online complaint with Delta asking for compensation for the hotel room I had to rent on Sunday evening. 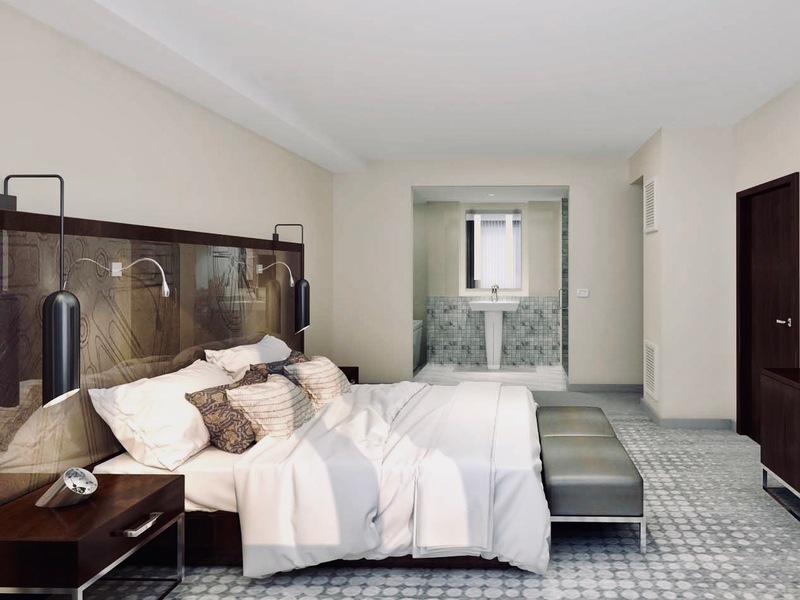 Delta said in the aftermath of the power outage that they would reimburse travelers for hotel rooms, but I was doubtful whether they would actually honor the promise — especially given the fact they could easily argue that the power outage was not their fault. I received the following email from Christina Grier, a Delta customer service agent, on December 30. I’m happy to report that Delta will, indeed, pay for the room. Thank you for reaching out to us to share your concerns about your travel experience from Amsterdam to Atlanta aboard DL9275 on December 17, 2017. 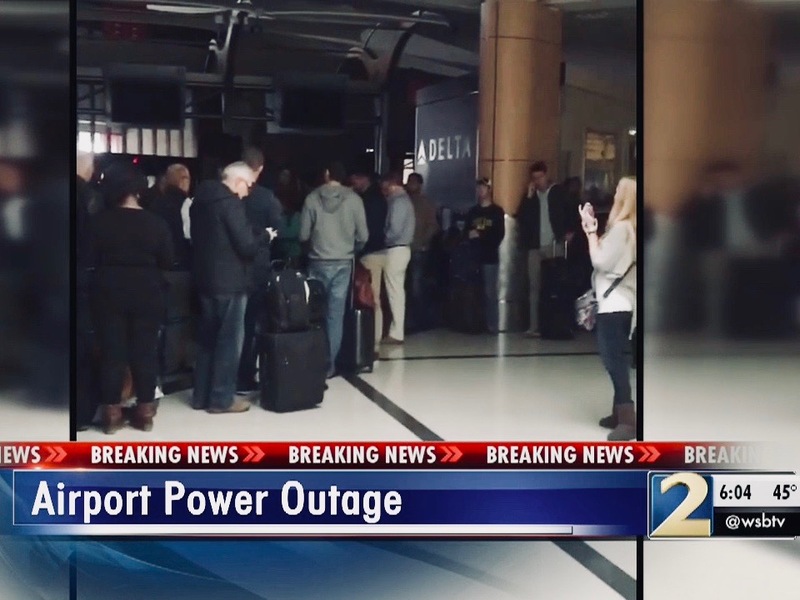 Based on your description, I can understand your concern regarding everything that took place during the power outage at Atlanta Hartsfield-Jackson International Airport. I tried to contact you by phone and was unsuccessful and I wanted to respond to you as quickly as possible. I’m truly sorry for any inconvenience you experienced which was a direct result from the power outage that affected our operation. This situation caught us all off guard and I feel bad it’s made you question our credibility. 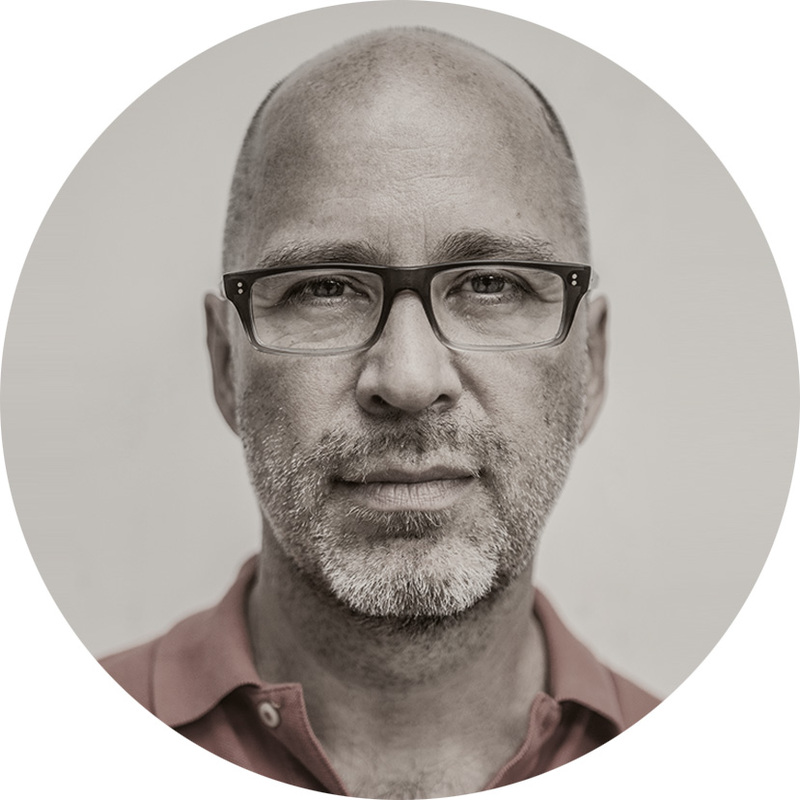 While we pride ourselves on core behaviors that include trust, integrity and honesty; we also understand the self-importance of having an unfailing system and strong service recovery plan in place. We know it hasn’t been easy for our passengers and everyone inconvenienced by this circumstance is our top priority. 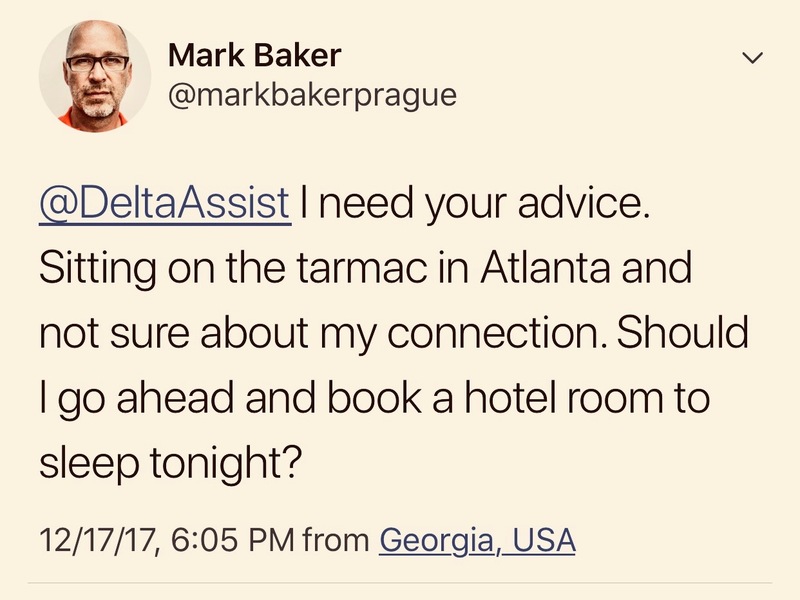 You stated that you incurred out of pockets expenses for hotel stay that evening your connecting flight to Pittsburgh was canceled. As a goodwill gesture, we will reimburse the charges which totaled $138.23. Please allow 10 to 14 business days to receive the check. Again, I’m sorry we let you down. I’ve shared your comments with our Flight Operations and Airport Customer Service leadership teams for internal review to improve our service for your future travel. Mark, I love that you are a member of our Frequent Flyer program and your loyalty speaks for itself. I hope that your next flight with us is more memorable.